Last year this time, I shared some of my memories of spending summer time at my grandparents' cottage in Pennsylvania. A recent post by mep at Not to Brag reminded me of other cherished moments spent in the company of my grandparents. My cousins and I spent hours playing in Grandma and Pap's attic, with the toys leftover from our parents' childhoods. I loved the horses that went with my mother's Roy Rogers and Lone Ranger dolls/figurines. I was fascinated by the ways that each country was represented in tiny "Dolls of the World," most of all that the United States one was a cowboy. There was a circus big top and a dollhouse, and many dolls and their clothes. I also specifically remember playing Cootie, but I feel sure looking back that this was something my grandmother bought for us grandchildren, rather than a leftover from our parents. 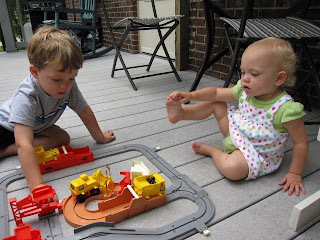 I have such vivid memories of playing with these "antique toys." Perhaps it was that they were ones I knew none of my friends at home had, perhaps it was simply part of the happiness of sharing time with my cousins and being so truly loved in my grandparents' home. Whatever the reason, I'm glad my parents have a large, unfinished basement full of toys from my own childhood to share with my children. O. and N. recently had a little vacation at Grandma and Grandpa's house, while J. and I traveled to a friend's wedding. The weather wasn't great, so they busied themselves with discovering "new" toys circa 1970's/80's. 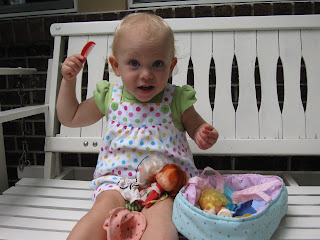 N. adored these "babies" which were just her size: Strawberry Shortcake and friends. She has since discovered the updated DVD's and books at our library. O. runs the Big Loader around the track. 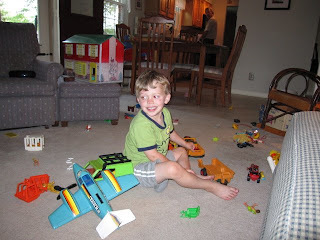 O. plays with an assortment of Fisher Price vehicles, most of them Adventure People. there were epic constructions of civilizations for these figures and their adventures. Last week, the kids, my mom and I went to Pennsylvania to visit my grandmother and spend some time at the cottage, bringing the whole memory sharing/creation full circle. We got chased out of "camp" one of the nights due to storms and no reliable technology to monitor them, so we had a sleepover at Great-Grandma's apartment. This is N. showing a possessive streak towards this vintage pull-toy "durdle." She insisted on taking it to bed with her while we were there. We haven't quite gotten to the point in our house where we've outgrown enough toys or equipment to make the move to get rid of massive amounts of "kid stuff." I'd love to have some extra room to breathe around here, and don't relish the idea of hoarding too much "stuff." However, seeing my children delight in these toys from the past has made me vow that I'll keep at least some of their very favorites around in the hopes that there will someday be another generation to enjoy them. *Cherry's home was rescued from the trash heap when Grandma moved out of that house, was repainted, decorated, and has since been used in nearly a dozen weddings as a "Card Cage." I'm so happy we saved all those toys! It was worth finding a place for them in the basement. M.
I totally missed this post when you first wrote it. Or else, I would have been all over it. 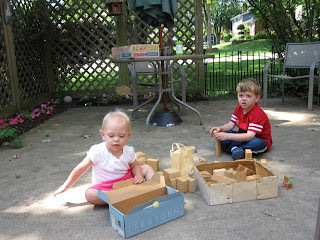 My kids and their cousins are loving playing with the toys my parents saved. Uncle Boo's vacuum is constantly vied for, and a wooden kitchen (painted pink) is still a hit as well. My mom also unearthed some Sweet Pickles books, and Bub is very intrigued with them, especially the way that you can spot characters from one book in another. Yes, I guess I will save some toys for my grandkids too. But, really, I have to say, just thinking about the fact that I could be a grandparent someday is blowing my mind. Hey! Mom! Write about me, too!